Okay, so according to Haas, the Trump team deliberately blindsided Kim in order to sabotage the negotiations. That sounds about right. Of course none of this has popped up in the western media where US leaders are typically extolled for their unshakable virtue while their rivals, like Kim, are vilified as “brutal dictators who can’t be trusted.” Regrettably, the facts tell a different story. What was particularly puzzling about the summit was the manner in which the negotiations were conducted, that is, there were no negotiations at all, not really. The Trump delegation simply listened politely to Kim’s offers, scratched their chins and then rejected them without debate or counter proposal. In other words, the whole summit was a fraud. The US did not come to argue, dicker, quibble, wrangle or haggle on any of the key issues. In their minds, the final verdict was already was set in stone before they ever touched down in Hanoi. It was a done deal. The sanctions would continue to be enforced until the DPRK government collapsed or until hell froze over, which ever came first. The media would like readers to believe that the credulous Trump narrowly escaped a lethal trap set by the evil despot, Kim Jong un. But that’s not what happened at all. What happened is that Kim showed his willingness to go the extra mile for peace but was slapped down by an unreasonable, inflexible and intractable adversary who remains focused laserlike on preserving the status quo, intensifying the sanctions and paving the way to regime change. That’s what the summit really proved, that one side is looking for compromise and resolution while the other favors confrontation and conflict. So why did Trump agree to go to Hanoi if he had no intention of hashing out a deal? What did he hope to gain by looking rigid and unyielding while Kim made every effort to find common ground? Didn’t he know that leaders in China, Russia and South Korea would be following every word, putting every minute detail under the microscope, and convening high-level meetings to decipher what really took place? Maybe those things don’t matter to Trump but they’re certainly going to affect the way that Kim’s allies address the sanctions issue in the future. After Hanoi, I would expect Russia and China will look for ways circumvent the sanctions in order to reward Kim for the steps he’s taken towards denuclearization, after all, Russia and China do not seek a permanently divided peninsula or regime change. They simply want Kim to abandon his nukes program for the sake of regional stability. That was the original purpose of the sanctions, to stop the provocative nuclear and missile tests that were intensifying the clash with Washington. But now the sanctions have taken on a life of their own and are being used to pursue a geopolitical agenda that conflicts with Russian and Chinese national security interests. That wasn’t plan. Neither Putin nor Xi Jinping want to see North Korea brought to its knees creating another failed state that becomes a hotbed of terrorism and anarchy. That’s not what they want at all. They want a North Korea that is ready to participate in their massive economic integration plans (One Belt, One Road, Eurasian Economic Union etc) They want a North Korea that enjoys the benefits of modernization, state of the art technology and infrastructure, high-speed rail, gas pipelines and ever-improving standards of living. They want a North Korea that is an ally, a partner, and a friend that will participate in the shared vision of a giant pan-Asian free trade zone that benefits all equitably while respecting the sovereign rights of the individual nation-states. They want to implement a regional development plan that doesn’t put western banks and corporations at the top of the ladder where they arbitrarily impose ‘the rules of the game’ on everyone else. This is what Beijing and Moscow want, and this is what Kim wants. He wants to set aside his nukes, end his conflict with Washington and get on with the business of making money. Sound reasonable? Since then, the-economy-as-priority has been regular fare in North Korea’s media and from propaganda organs. Mr. Kim spent the summer months visiting farms, factories and tourist resorts, often chastising cadres for failing to implement development projects fast enough. During recent festivities celebrating the country’s founding, the parade featured floats with economic slogans and no ICBMs. If the iconic image of Mr. Kim in 2017 shows him watching a missile test, the one for 2018 shows him inspecting a fish cannery…. “On his visit to Pyongyang this week, South Korea President Moon Jae-in brought the heads of state-backed rail and energy corporations, along with the CEOs of South Korea’s top conglomerates. No deals were struck, and the group has been mum so far about its meetings. But its presence was enough to send the message that South Korea stands ready to move forward with major economic cooperation projects with the North. 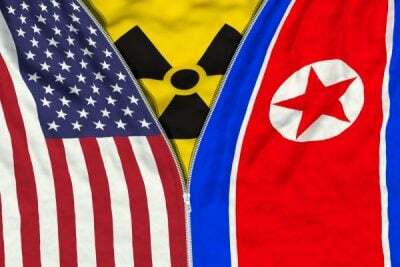 “US Secretary of State Mike Pompeo said Sunday that if North Korea agrees to fully dismantle its nuclear weapons program, then the United States will allow American companies to invest in the country. “This will be Americans coming in — private-sector Americans, not the US taxpayer — helping build the energy grid,” Pompeo said in an interview on “Fox News Sunday.” “They need enormous amounts of electricity in North Korea, to work with them to develop infrastructure.”… Pompeo added that Americans will also help invest in North Korean infrastructure and agriculture to help feed its people if the country meets US demands. See? None of this has anything to do with Kim’s nukes, it’s all about money. The administration wants the North to open its markets on Washington’s terms which means the free movement of capital, safeguards on foreign investment, the mass privatization of state-owned assets, and preferential treatment for the uncompetitive, monopolistic US-backed mega-corporations that control the state behind the illusion of democratic government. And that’s why the Summit failed, because Kim wants to join an emerging coalition of independent nations that are building a prosperous multipolar world for the future. Washington is determined to prevent that at all cost, which is why Trump walked out of the meetings in a huff. He wants to nip this thing in the bud.